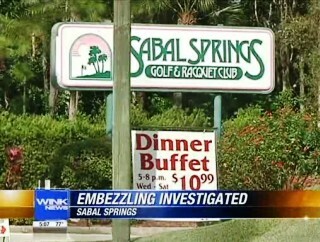 NORTH FORT MYERS, Fla.- Board members of the Sabal Springs Golf and Raquet Club filed charges Wednesday against the former president of the homeowners association, claiming he embezzled more than a $1 million over the last 3 years. Kay Joyce has lived in the Sabal Springs community for the last 16 years. When homeowners were notified the board would pursue legal action against their former leader, Joyce said, "I was really disappointed that something like that could happen to our community." The report filed with the Lee County Sheriffs Office says an audit conducted by the association's treasurer showed the accused would write a check or transfer money from the reserve account to Sabal Springs Golf, to himself, or to his father. Board members say the accused admitted to taking $665,000. The incident report also says millions of dollars are funneled through the Sabal Springs Golf and Raquet Club every year, although it only generates about $140,000 in total income. The Lee County Sheriffs Office economic crimes unit is investigating the claims.